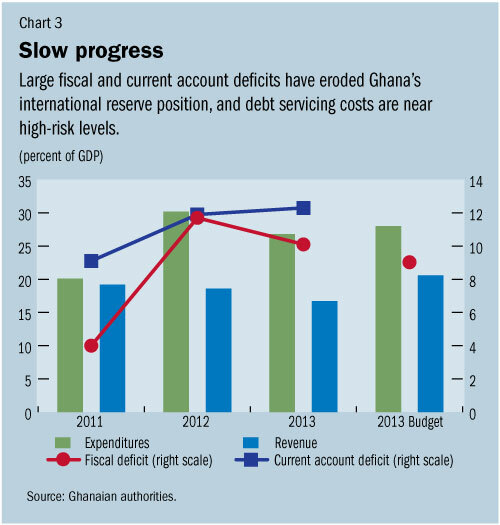 Having been the fastest-growing economy in sub-Saharan Africa in 2011, Ghana is heading for a third successive year of slower growth, as large current account and budget deficits expose the economy to risks. The main priority now, the IMF says in its regular review of the West African nation’s economy, is to restore macroeconomic stability by addressing short-term vulnerabilities that put Ghana’s transformation agenda at risk. 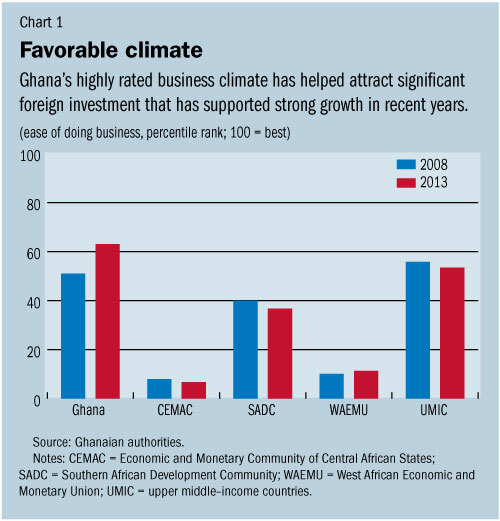 Ghana has experienced strong and broadly inclusive growth over the past two decades. The country has outperformed regional peers in reducing poverty and improving social indicators. Robust democratic credentials and a highly rated business climate, have helped attract significant foreign investment, supporting strong growth and a graduation to lower middle–income status. Yet the economy faces a number of important challenges. About a quarter of the population still lives below the poverty line, firms lack access to affordable credit and reliable electricity supply, and 6–7 million jobs – more than half of the current labour force – will need to be created in the next two decades. To address these priorities, the government’s transformation agenda focuses on economic diversification, social inclusion, and macroeconomic stability. 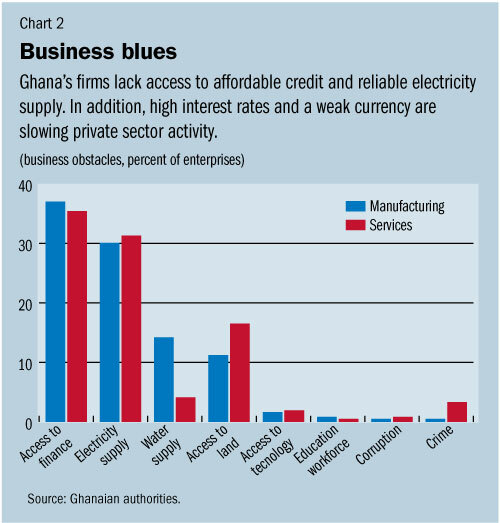 While Ghana’s growth still reached 7 percent in 2013, it has slowed from previous years. IMF staff projects a further slowdown to less than 5 percent this year, as high interest rates and a weaker currency are depressing domestic demand. At the same time, the economy’s continued large twin deficits and high financing needs, leave it vulnerable to weaker external conditions. • In response to shortfalls in tax collection and grants, and ongoing overruns in the wage bill, the government in 2013 imposed levies on certain imports and on profits of specific sectors. It also eliminated fuel subsidies; sharply raised electricity and water tariffs; and compressed other spending. Despite these significant policy efforts, the 2013 fiscal cash deficit reached 10.1 percent of GDP. • In the near term, the government’s 2014 budget focuses on mobilizing additional revenue, while containing current primary spending. The value-added tax rate was raised and the coverage was broadened to previously exempted activities. At the same time, there is an increased effort to control the wage bill through tight budget limits and strengthened payroll monitoring. • In early April, the government issued a policy document outlining its home-grown strategy to address current economic vulnerabilities. The strategy focuses on public sector reform, including rationalization of the public service; weaning off subvented (public service) agencies from the payroll; restructuring of statutory funds to reduce budget rigidities; and revenue administration reform to increase effectiveness and improve tax compliance. • The Bank of Ghana further tightened monetary policy in early 2014, with an increase in both the policy rate and reserve requirements. Yet administered price increases and a depreciating cedi are fuelling inflation, which rose to 14½ percent in March – above the end-year target band of 9.5 +/- 2 percent. The IMF said in its review that a strong package of policy measures is required to address large imbalances and provide the needed space for infrastructure and social priority spending. IMF staff welcomed the government’s home-grown strategy, adding it should now be translated into specific, quantified, and time-bound actions. In light of the significant vulnerabilities, the review recommended taking further steps toward a larger and more front-loaded fiscal adjustment. This could set off a virtuous cycle of lower fiscal deficits and falling interest rates, creating room for higher social and infrastructure spending and a crowding-in of private sector activity, consistent with the government’s transformation agenda. The IMF suggested further monetary policy tightening if inflationary pressures from second-round effects of large administered price increases and from the exchange rate depreciation persist. It recommended tight liquidity management, including less direct financing of the fiscal deficit. The Bank of Ghana should also allow the exchange rate to continue to adjust to prevent further erosion of an already low reserve buffer and to rebuild reserves as external pressures subside. Stress tests conducted by the central bank – based on end-2013 data – point to adequate buffers in most banks and the financial system in aggregate. IMF staff welcomed the authorities’ new stress-testing model, and encouraged them to develop it further and test for a wider range of shocks to ascertain its robustness. Expedited completion and adoption of new banking sector legislation will be important to enhance banking sector supervision.